The jazz poets were right, of course: the city of light is at its most entrancing from April until May. And this spring, there’s so much to enjoy beyond the typical café terrace culture. If you’ve only got time for a whirlwind visit, it’s still worth it—here’s the way to do it. Ditch the clichéd croissant with jam for a grander eatery, like the newish Les Grands Verres at Palais de Tokyo, serving Mediterranean-inspired fare. A leader in Paris’ recent brunch revolution, this warm, blonde wood-furnished site also houses an edible garden and its very own beehives. Plus, its patio overlooks the Seine. 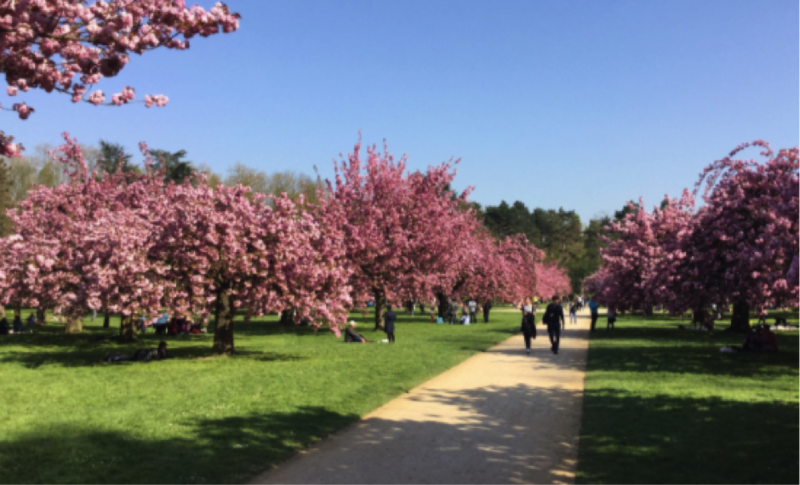 The increasingly popular Parc de Sceaux—with its Versailles-style gardens, quaint chateau and picturesque springtime cherry bloom—is a good half hour south of Paris. Save the trip and head instead to Square Jean XXIII, behind Notre-Dame. There, the cherry blossoms are equally resplendent, hiding and revealing slithers of gothic architecture like glorious pink-and-white clouds. Be it a niche fragrance laboratory or an old-school perfume maison, Paris is still the world’s best place to buy perfume. We’re still enamoured by EX NIHILO on Rue Saint-Honoré, where you can design a custom aroma, right down to laser engraved glass or a personalised cap made from anything from onyx to mother of pearl. Once the ingredients are selected, your signature scent is mixed in front of you via the Osmologue, a hi-tech machine found in perfume factories. “Imagine if your coolest Parisian ami opened up her rooftop for all of her friends,” wrote Melissa Liebling-Goldberg, late last year for Vogue. “You’d play ping-pong, you’d barbeque, you’d have plenty of mixed drinks, you’d lounge for hours. Welcome to the laidback vibe of Mama Shelter’s hip rooftop bar.” This casual spot in the 20th arrondissement is a little out of the way, but worth it to soak up the sunshine beneath brightly-printed umbrellas. (For aperitif, the bar opens at 4pm.) If you fancy something more DIY, stop at open-air street market Marché Bastille, and gather fresh fare—from bread to cheese and ripe, bright red strawberries—for a picnic by the canal. Make for the Musée de l’Orangerie’s most anticipated exhibition this year—‘The Water Lilies. American Abstract Painting and the Last Monet’—to see a smattering of the impressionist master’s breathtaking later works, placed alongside major paintings by American abstract expressionists of the 50s, including Rothko, Pollock and Elsworth Kelly. This is nature immortalised. No springtime sojourn is complete without a dinner that stretches deep into the night, paired with good company and wine. Bistro Brute—a 20-seat spot by young chef Mickael Poyault—is cool, contemporary French bistro done right, all prepared in an open kitchen. Think goat-cheese jam and barley paired with salted turnips, or duck dipped in chocolate sauce. Sleep at the boutique Hotel Providence Paris, where suites are individually furnished with 70s statement pieces, outrageous scavenged wallpapers and generous lashings of velvet. Each room is well-stocked with a cocktail bar and kit.